1- 800 337 9477 - Call the Austria experts for immediate assistance ! 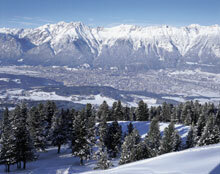 Tirol’s capital Innsbruck is situated in a wide, rich valley between high rocks and mountains. Numerous art treasures and historic structures can be found in this 800-year old town. Narrow alleys and high houses are a trademark of the historic city center. Innsbruck is not just famous for hosting the Olympic Winter Games twice but is also known as a university city, a convention center and an important industry site in Austria. Stroll through the labyrinth of alleyways and admire the charming old town with its baroque and gothic styles. Many medieval houses are nicely painted in pastel colors. The old center is one of the best kept middle aged city centers of Austria. Make sure to pay the new baroque Cathedral a visit. Built in 1717, it was heavily damaged in the 2nd World War and reconstructed in 1950. Admire the beautiful ceiling paintings as well as the gorgeous arch stucco. The high altar with the famous Maria painting is just splendid. The Innsbruck carillon sounds for peace (bells). 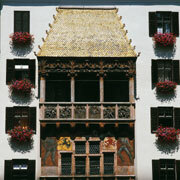 Just next to the “Golden Dachl” is a beautiful house which was first built as a late gothic building but was changed to the baroque style in 1730. Beautiful ornaments decorate the front. The Imperial Church (built 1553-1563 in the gothic style) consists of three naves, round and pointed arch windows and a steep roof. Inside the Imperial church the memorial of the Emperor Maximilian I is the most famous emperor tomb memorial in Europe. The black marble sarcophagus with the bronze statue of the emperor builds the middle. Around the sarcophagus stand 28 larger than live bronze statues of his ancestors. The Renaissance organ is one of the five most famous organs in the world. Once the seat of the Tirolean sovereigns, it was constructed in the gothic style around 1460. Due to the influence of Empress Maria Teresa, it was rebuilt between 1754 and 1773 in the baroque style. Consisting of four wings, the palace also has a huge two-story hall with portraits of the Habsburg family. This impressive ski jump arena stands on historic ground. It was scene in the 1809 Tirolean War of Independence. The first wooden construction was built in 1925. After the Olympic Ski Jumping competitions in 1964 and 1976, the star-architect Zaha Hadid designed the new ski jump in 2001 which was completed in September 2002. If you are in shape, climb the 455 steps from the stadium entrance to the ski jump tower. There is also an elevator which covers the 250 m (820 ft) in approx. 2 min. Take a break and have a cup of coffee in the panoramic restaurant in the tower of the ski jump and enjoy the spectacular view of Innsbruck. Visit the art of crystal fiction! The glittering fairy tale landscape, imbedded in a park with secrets, issues and invitation to dream. In 1995, the multi-media artist Andre Heller ceated a place of ture amazemnet with 14 subterranean Chambers of Wonder. The continuously evolving crystal interpretation of these chambers is in itself a reflection of the joy of innovation and dynamic that represents the highest maxims of the worldwide leader in the production of precision-cut crystal. If you are a romantic, visit the Renaissance Castle Ambras just above Innsbruck. The castle was built as a summer residence 1563-1595 by Archduke Ferdinand II for his wife Philippine Welser. The divided castle (lower and upper castle) was the center of the courts cultural life. The lower castle contains a museum with arms and armor, art, books etc and in the upper part of the castle is a Habsburg Portrait Gallery. Stroll through the beautiful park surrounding the castle and enjoy the sight of this medieval fortress. Innsbruck is situated next to the Alpine Transit road Brenner to South Tirol (Italy), 170 km (106 miles) from Salzburg and 476 km (296 miles) from Vienna. The airport is just a few miles from the city center and can be reached easily by public transportation. In just 17 minutes you reach the railway station in Innsbruck and after a mere 10 minutes walk you are in the center of Innsbruck.